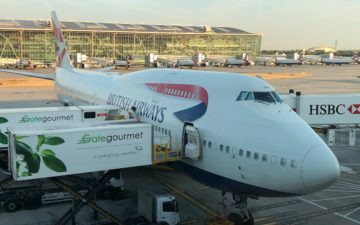 While I’ve flown BA first class several times before, including from London to Los Angeles, London to Seattle, and Seattle to London, this was my first time flying British Airways in first class out of New York. It’s their second largest longhaul station, and aside from London Heathrow, the only airport with a Concorde Room. Anyway, I made it to JFK at around 7PM for my 9:30PM departure to Heathrow. Terminal 7 is primarily run by British Airways, but also shared by United, several oneworld partner airlines, and a few other random airlines. The premium oneworld check-in is located at the far end of the terminal. 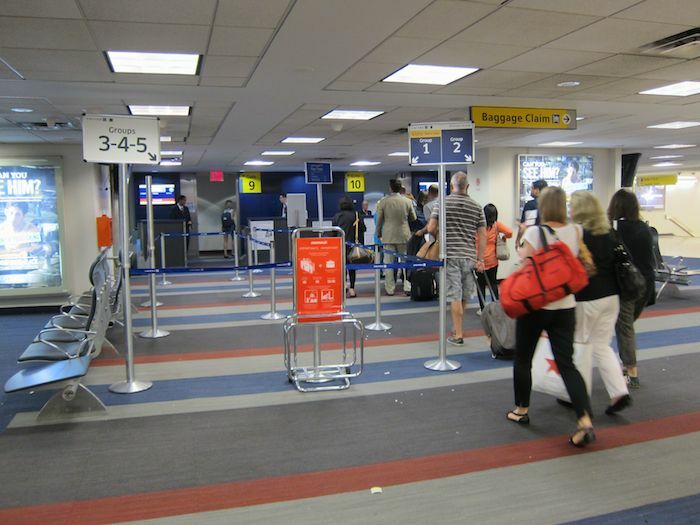 At the far end of the terminal you have a variety of counters, including ticket sales, as well as first and business class for most oneworld airlines. 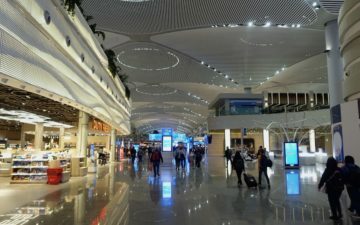 It’s a fairly nice space, and in my experience never really crowded, even during peak travel periods (probably since many premium passengers on British Airways are checking in online and not checking bags, so there’s no need to stop by the counter). There’s even a seating area in the business class check-in section. Then at the far end of the check-in area, right next the Fast Track security, is first class check-in. While the business class check-in area has couches, the first class check-in area has fancy British couches — sweet! The check-in process was efficient, and within a minute I was issued a boarding pass. Bonus points to anyone that can figure out who I by chance snapped in the below picture (and later proceeded to fanboy over). The Fast Track security lane is usually pretty efficient (though good exercise, since it’s built on an uphill slope), and then once through there the Concorde Room is located immediately to the left. At the desk was an older New Yorker lady and a young British guy. This was my first time in the New York Concorde Room, so I had no clue what to expect. The lounge was reasonably nice. 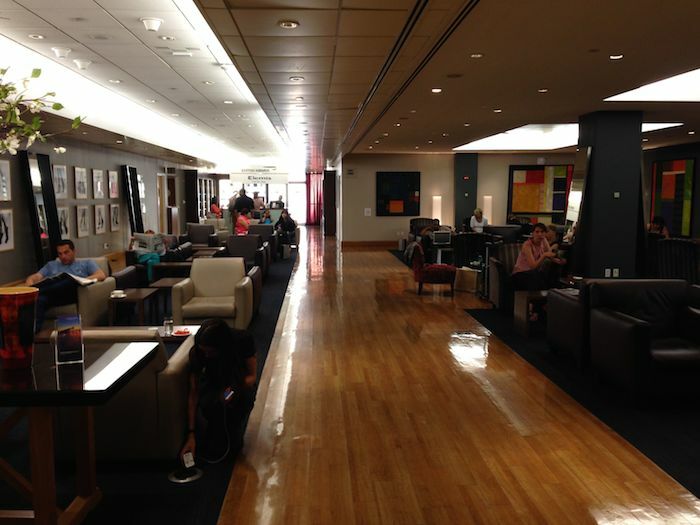 The long walkway led to the main area of the lounge, which had the bathrooms to the left and a place to store bags to the right. Why does it look like my grandmother’s basement rec room? It was nice enough, it just wasn’t especially modern, I guess. There was some more seating on the right side of the lounge. That’s also where the business center was located. I ended up picking a “cove” in the back corner of the lounge where I eventually settled down. That might mainly be since it boasted a nice view of the tarmac — in particular, the A318 that operates the British Airways Club World London City service. It’s worth noting that the Concorde Room doesn’t have shower rooms — the Elemis Spa and showers are located in the Galleries Lounge, which is on the other side of the terminal. The bathroom in the Concorde Room just had a couple of stalls and sinks. Once settled into the Concorde Room I decided to walk over to the Elemis Spa to make an appointment. Like I said, it’s located on the other side of the terminal, so is maybe a three minute walk. I asked the agent at the Concorde Room entrance whether she could help with a spa appointment, though she explained that there’s a phone in the Concorde Room that you can pick up to make an appointment. Instead I figured I’d just walk over there. The Elemis Spa is located at the far end of the Galleries Lounge. You can choose from a variety of 15 minute treatments. Much to my surprise, there was availability immediately, so rather than schlepping back and forth I figured I’d have my treatment right away. I was directed to wait in the “relaxation area,” which consisted of a few lounge chairs. I decided on the “stress-away shoulder to scalp” massage in the “intelligent massage chair.” So while it was mostly the chair itself doing the work, it was a refreshing 15 minute treatment. The chair focused on my back and legs, while the masseuse worked on my scalp and shoulders. As usual, there was a sales pitch and survey after the treatment. Right next to the dining area is the bar, which has a full selection of drinks as well as a small cheese buffet. It prominently displays their selection of a dozen or so wines. The centerpiece, of course, is their champagne selection. As much as I give British Airways crap about a lot of things, they hands down have the best lounge champagne of any airline in the world. They serve Laurent-Perrier Grand Siecle and Laurent-Perrier Rose in the lounge, both of which are lovely. Once seated a server came by to introduce herself and present me with the dinner menu. In addition to the dinner menu was an iPad with the beverage list. I hadn’t really eaten anything substantial all day, so ordered the crab cake to start, then the filet mignon, and then the hazelnut chocolate torte. I of course had some Grand Siecle to accompany the meal. The meal was served at a decent pace — the crab cake was served about 10 minutes after I ordered it, and was surprisingly tasty and artfully presented. The filet was rather disappointing. It tasted like a sirloin you’d get at Outback Steakhouse, and not like a good filet mignon. The hazelnut chocolate torte for dessert, however, was rich and delicious. I stayed at the dining table for a while. Boarding was scheduled for 9PM, so I stayed there till about 8:45PM. My one frustration about the dining area is that they didn’t have any power outlets nearby. Surely I’m not the only one that wants to get some work done and charge my electronics while having dinner in an airport lounge? The one other thing I have to note about the lounge are the people. And I realize this may just be because I don’t come from old money (or money at all, for that matter), and am not British. But I don’t think I’ve ever eavesdropped on such pretentious conversations. There were these two British twins traveling with their mother sitting near me, and they both had matching Rolexes. They loudly discussed sailing, and then moved on to how excited they were to get back home and “ride” (presumably horses). Anyway, at around 8:45PM I left the Concorde Room and headed to my departure gate, Gate 10. It was located on the other end of the terminal, so was just a short walk away. Much to my surprise, boarding was well underway by the time I got there, and they were boarding all rows and zones. On the plus side, their champagne selection is excellent. The lounge itself is reasonably nice, though the decor is definitely dated. I liked the sit down dining concept, vs. the buffet they have for business class passengers in the other lounge. All the staff in the lounge were friendly enough. I do think it’s a bit annoying that the spa and showers are located in the other lounge, so you have to trek across the terminal if you want a shower or 15 minute massage. Beyond that, and I’m not sure if there’s a good way to explain it, the lounge just felt stuffy. Like, it wasn’t actively fun to be there. I felt like I was sitting in a stiff country club more than anything else… and I bet that’s what they’re going for, so I’m not blaming them for that. But really let me just briefly contrast it to the Virgin Atlantic Clubhouse at New York JFK. And let me preface that by saying that I’m not the typical “Virgin” customer. I’m not a hipster, I don’t think I’m cool, and I refuse to even try to dance. Despite that, their lounge at JFK just has such a fun vibe. It’s fun to be there, the staff all love what they do, they have a sit down restaurant, and the spa has a larger variety of services, including haircuts (which, when you live in hotels full time, comes in handy). The only downside to the Clubhouse is that the champagne selection isn’t as good, and the food isn’t quite as “high class” as in the Concorde Room, though it is well executed. 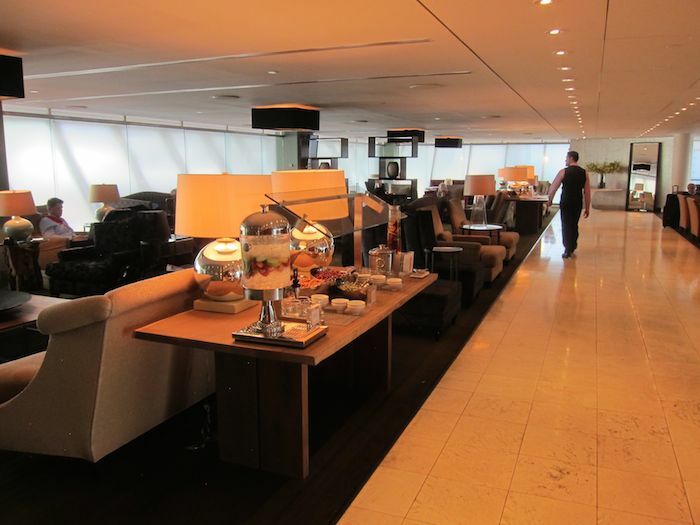 That being said, I would hands down rather use the Virgin Atlantic Clubhouse than the British Airways Concorde Room. And that applies in both New York and London. Don’t comment often, but a note to thank you for this review and your work in general. Well done and very helpful. “And I refuse to try to dance”. That sounds suspiciously like something a hipster might say. @ YouMightBeAHipster — Haha, touche! Funny, I was there about three weeks ago and had the exact same meal. Same starter, then the filet mignon and the chocolate hazelnut torte. @ Pietro — Was your filet better? @ Lucky – I was just thinking about that, mine was pretty good. Also, yours looks fairly dry (from the picture), mine wasn’t like that. I think you are cool lucky. Don’t mind the twins. Anyone with real money flies privately and wouldn’t be caught dead in a Rolex. They’re the Donald Trump of watches. I wouldn’t be so hard on the twins. As you get older you find yourself more tolerant of even the douchiest people; you realize we’re all in this life just trying to get by the way we know how. And hey as long as they’re not spoiling your time, live and let live! They tried to warn you about the Filet when they stated it was “grass fed”. Its the corn feed that makes US Prime beef so tender and flavorful. Grass fed is slang for dry, stringy and flavorless. 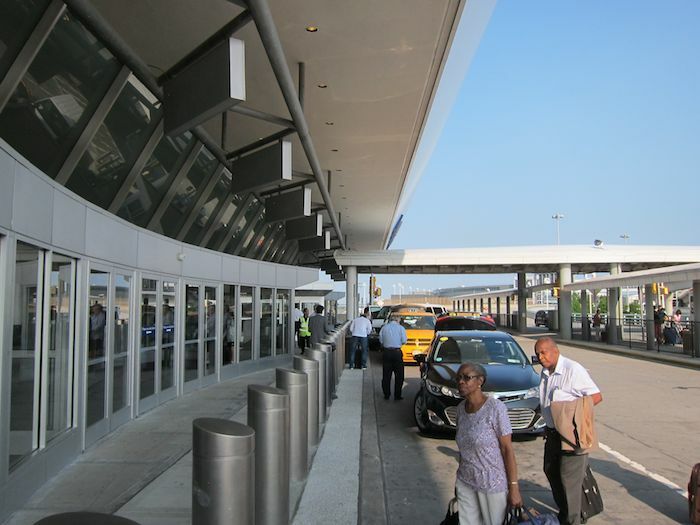 I was at the exact the same place last place to take a picture of T7 exterior with Club World sign but a ground staff yelled ” no picture allowded” Also happened to me at JFK Virgin Atlantic say no picture at drop off spot. Does this ever happen to you or it is such a big deal? despite the frumpy decor, the dining area and food looks better than at Heathrow. Also, they only had Taitinger Rose there on Wednesday, so JFK beats that with both LP selections. How were the showers in the spa? The ones at Heathrow defy belief – absolutely disgusting – so grungy and moldy with pipes making all kind of nasty sounds! Unbelievable that they haven’t done anything about them! @ Shannon — Interesting, can’t say I’ve ever had that happen in the US (though a few times abroad). Actually in the Concorde Room the guy encouraged me to take pictures. Thanks for the review lucky – always great to hear! Was just passing through this lounge some days ago and nearly had the same menu as you; well, took the crab cake twice – and yes, the filet looked better 😉 I might be biased due to my CCR-card, but I really do value this lounge as it’s quiet most of the times and less crowded than the Virgin Clubhouse, so it lets me calm down after a hectic day at work. The staff is great, very attentive and most of them are definitely way better trained than in the average lounge, e.g. one of the duty restaurant mangers could be the host at a nice city restaurant. But I do agree that it’s really a pity that the CCR in JFK has no showers, that’s really something that needs to be addressed! The reason for so many different lougnes is there used to be boarding inside the concorde room for concorde flights in both london and nyc. When it retired they just kept the “concorde room” room for first class passages of course over the years it has been upgraded. To me, pretentious would be to try to have such a conversation loudly enough that others nearby can hear their topics of conversation. Otherwise… that’s just what’s important to them in their lives right now. I love when you highlight peoples behaviour like the sweater story and the chinese shirtless and those boys conversation. It adds so much joy on reading the trip report. The Concorde lounge at LHR is disgusting along with the spa, cleaning and hygiene are not a priority! Loud mouthed people regardless of age talking about possessions are referred to as “Bogans” the English know it well. NO SHOWERS! That’s a disgrace…………and to expect the Brits to prepare ANY food correctly is an unreasonable expectation. Thanks for taking one for the team………what were your fuel surcharges? As mentioned above, the photo you snapped was of Alan, the BA manager for JFK terminal 7 featured in the BBC documentary A Very British Airline. So judging other people from partial snippets of conversation or watch preference (perhaps a gift) isn’t a sign of prententiousness or at least inverted snobbery. Much prefer when this blog sticks to main subject matter, which is normally artfully crafted, rather than snide adolescent judgement. I find everything about BA to be sub par. The JFK CCR is as you stated just not that grand in anyway. Last time I also hung out in that back area. Stuffy and loud. I find the F lounge better. @Robert Hanson – coming from a family of beef cattle ranchers it’s refreshing to hear you say that. Lots of factors influence the quality of meat, but to many grass fed = new/trendy = good with little further thought. Thx for sharing your experience with us! I always wondered what the JFK Concorde room was like. Do you prefer the Concorde Room at JFK or at Heathrow? @ Joey — That’s a toughie. In absolute terms I prefer the London one I think, but compared to the other lounges at the airport, I think I prefer the New York one to the London one. Just flew JFK-LHR first class with BA. Nice but not the best. Your review of Concorde room is spot on. I found as a young guy who easily passes as a regular economy class flyer some staff weren’t holding back their surprise of me being there. The attitude of the waiter in the Concorde room waiter was very telling almost as if he wanted to say “what are you doing here?” Other than that the place was just dead boring. The documentary is nonsense though. The condition of checkin security etc is nowhere near the standard they make it out to be. For example plenty of scuffs were visible on the floor. Not that I mind but in the documentary they show the manager looking out for them and having them cleaned instantly. My experience in the Concorde Room at JFK today has been mixed. The staff in the dining area have been excellent and the food quite good. The staff at the entrance, however, have been unprofessional, even rude. When I entered, Ms. Eleni greeted me by yelling, “THIS IS CLOSED!” and then proceeded to yell at me and interrupt my speaking at every turn. There was no sign saying the hours and the door opened. I think a simple “good afternoon” would have worked. Even when I tried to explain that this was not the best way to start my travel experience she yelled and argued back. Later when I returned she offered the same caustic attitude, blamed me for the problem, and never apologized. This single encounter will deter me from contemplating future BA First flights. @ Matt — Sheesh, sorry to hear about that! Hi. I have a question. The 15minutes un Spa. Are free? 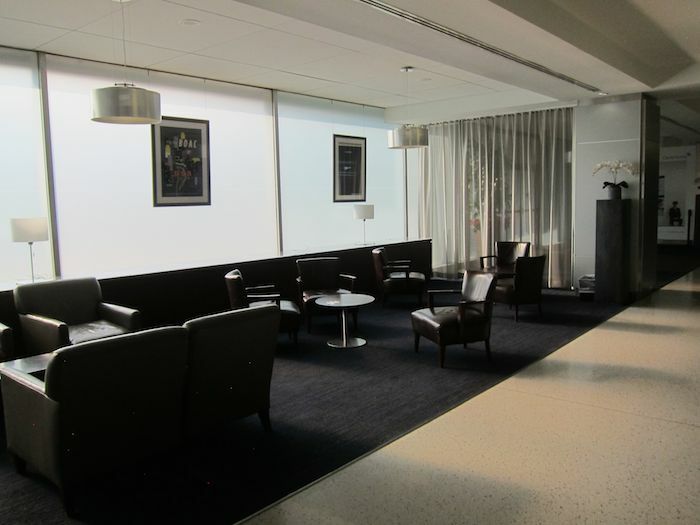 Is the Concorde Room at JFK the actual one used when BA operated it’s SST service between LHR & NYC? Or is it just a space they’ve badged as the CCR like the one in T5? One comment however: the pretentious conversations that you overheard almost certainly came from British ‘new money’ rather than old. Classically British ‘old money’ families wouldn’t dream of having pretentious or ostentatious conversations in public that might be overheard. All part of the famous British reserve and embarrassment of being thought of as ‘posh’. ‘New money’ families on the other hand, can’t wait to let everyone know how much money they have. As the ‘old’ families would say: really quite vulgar. Thanks again for the great review and photos!